A new study highlights the benefits of a globally open economy. At a time when foreign trade is on the front burner of the national debate, a new study offers estimates of the economic benefits of a globally open economy. Depending on the assumptions that are made about consumer and producer behavior, international trade raises the U.S. gross domestic product by between 2 and 8 percent, Arnaud Costinot and Andrés Rodríguez-Clare report in The U.S. Gains from Trade: Valuation Using the Demand for Foreign Factor Services (NBER Working Paper No. 24407). The researchers not only present new evidence on the gains from trade, they also explain why the range of estimates is so large. There is surprisingly little direct quantitative evidence on how the U.S. economy would react if the door were shut on trade. To find a precedent, the researchers point out that one could go back to the Embargo Act of 1807, when the United States banned trade with Great Britain and France in retaliation for their repeated violations of U.S. neutrality. GDP declined sharply, but the agrarian world during the presidency of Thomas Jefferson bears little resemblance to today's high-tech, service-oriented economy. To analyze the impact on U.S. GDP of shutting the nation's borders to outside trade following a "textbook approach" requires collecting price data on thousands of items across the world and estimating the extent to which they are substitutable for U.S.-made goods. As the researchers write, "the amount of actual information required to implement the textbook approach is, to put it mildly, non-trivial." To simplify the analysis, they elect to focus on trade in factor services, namely the labor and capital embedded in goods purchased from around the world. They then estimate the gains from trade by comparing the size of a counterfactual U.S. economy that depends entirely on domestic resources with one that has access to foreign factor services through international trade. This exercise raises two key questions: how large a role do imports of factor services play in the U.S. economy, and how elastic is the demand for those services? 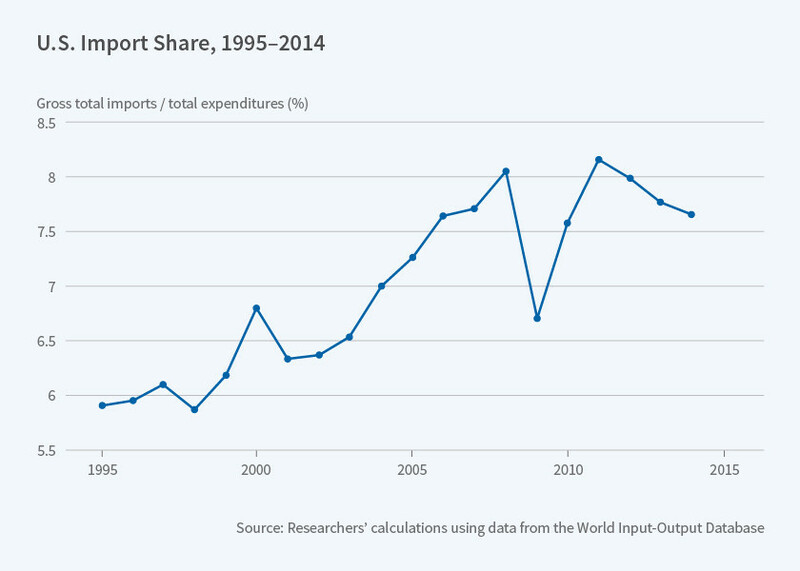 While the dollar value of U.S. imports is large, as a percentage of national spending it is relatively small. The researchers suggest that one way to measure this percentage is to assume that the total value of all imported goods is equal to the total payments for the foreign factors used to produce those goods. This yields a value of 8 percent of total U.S. spending in 2014. Measured in a more comprehensive way, however, U.S. imports are significantly higher. When the researchers adjust by the fact that domestic production also uses imported intermediate goods — say, German-made transmissions incorporated into U.S.-made cars — based on data in the World Input-Output Database, they conclude that the U.S. import share is 11.4 percent. While there are different approaches to the measurement question, an even more contentious issue concerns the elasticity of demand for imports. To what extent are foreign factor services close substitutes for domestic ones? Demand is likely to be inelastic if it mainly captures imports of minerals that are only mined abroad, but elastic if it instead includes wheat that is grown in the U.S. as well as elsewhere. For many apparel companies, the demand for cheap foreign labor is inelastic; they could not sell garments stitched in America at competitive prices. The researchers do not offer a single estimate of the gains to the U.S. economy from international trade, but they suggest that the reasonable range falls between 2 and 8 percent of GDP. They acknowledge that while foreign trade raises the level of economic output, not everyone is a winner. Consumers enjoy lower prices, but some workers may see that benefit offset by declining wages or layoffs.